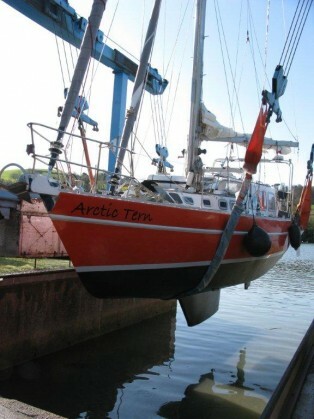 Arctic Tern is a 43ft Bruce Roberts Steel Cutter Rigged Pilot House Yacht. She has ten berths but we only use up to eight, to ensure adequate space and comfort. When we first viewed Bold Explorer it had an air of considerable neglect, abandonment and botched repairs, with sails left unprotected on guard rails and boom. Considerable evidence of fire from the poorly designed dry exhaust, a nearly failed Hardy Spicer, worktops delaminating, leaking water tanks, a questionable spill return system from the injection pump, an alternator using the hull as –ive return and considerable use of gaffa tape which had obviously been a major component of the repairs kit. Interestingly none of the above were mentioned in a recent survey! Not to mention the toilet pipes almost totally blocked. Fortunately our experience of yachts enabled us to see through all this to the well-constructed and internally insulated and painted hull, a potentially powerful rig and an engine which will some modification and repair would be adequate. We moved onto her in November 2011 and set about a very necessary deep clean! Striping apart everything that looked suspect, water tanks removed and replaced, engine injectors serviced, a sea water pump added to the engine together with a heat exchanger core and wet exhaust installed with water trap and goose neck. Hardy Spicer serviced at specialist, spill return modified to return to supplying tank, one fuel tank leak repaired, engine hot air heater fitted. Galley worktops replaced with corian, an 80ltr freezer installed, leaking radiators renewed, With some rewiring and all batteries replaced, new smart battery charger, an 800 watt inverter, SCS Pactor 3 modem fitted, serviced navigational instrument’s, and a new Garmin plotter. All cabin lighting changed to LEDs instead of the potential 35 amp load of halogens! New lighter non slip flooring, a reflex heater, some much needed plumbing replaced, new taps, pumps, seats and lidsfor the toilets. On deck the manual windlass replaced with a powerful electric Lewmar windlass and a new 33kg Rochna anchor. Z-Spars Roller furling to both forestays, a new suit of Crusader sails including a fully battened main with stack-a-pack system. The mainsheet arrangement moved forward out of the cockpit, goalpost added to the stern for radar, Marlec’s new 914i Rutland wind generator, an 85w solar panel and GoPro Hero 2 Camera Mounting. We found an Aluminium RIB dinghy on EBay which with a Mercury 6HP four stroke outboard engine goes a treat. Renewing all the safety gear including immersion suits ready to code for charter. After that lot we were broke and just about ready for sea! During the one year of sailing and nearly 6000Nm another problem surfaced after about 1500 nautical miles, then mid Atlantic, which was a rudder fault. A poorly supported bearing, compounded by a buoyant rudder with end play in the shaft causing the rudder to nudge the underside of the hull and flex the bearing with the aid of the auto helm rams thrust. This was plated and stiffened in Nuuk, but would require lift out and some re-engineering which is currently being done in Lewisporte, Newfoundland where we are now. Also we have now got the aft heads fully functioning to our liking at last, and aim to add a doghouse over the companionway and modify the washboard arrangement before launching May 2013. Wishing you all the best for your trip, we are safely back in Conwy with our lovely new boat, Jura Haze. Will be following your adventures with interest!